AAPOD page link 28/May/2011: Each day a different image of our fascinating universe is featured as Amateur Astronomy Picture of Day. The cluster, the most obvious to the naked eye in the night sky, is dominated by hot blue stars that have formed within the last 100 million years, are among the nearest star clusters to Earth.. Dust that forms a faint reflection nebulosity around the brightest stars was thought at first to be left over from the formation of the cluster (hence the alternate name Maia Nebula after the star Maia), but is now known to be an unrelated dust cloud in the interstellar medium that the stars are currently passing through. 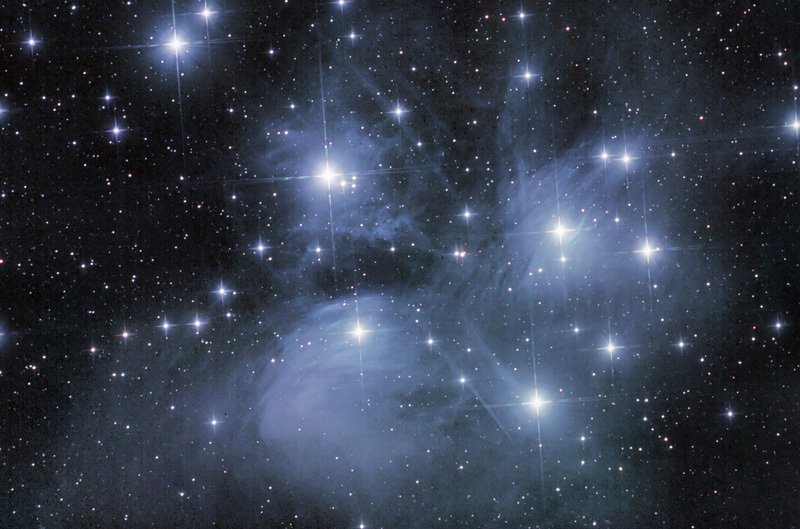 The Pleiades have been known since antiquity to cultures all around the world. The cluster core radius is about 8 light years and tidal radius is about 43 light years. The cluster contains over 1,000 statistically confirmed members. It is dominated by young, hot blue stars, up to 14 of which can be seen with the naked eye depending on local observing conditions.